Today I'm feeling a little minimalist challenge weary, which seems appropriate for the mid-way point. We had a really tough week, being the first week without OT for Daniel. These kinds of weeks make it hard to feel motivated to make the effort to prepare food at home (and we usually eat out a lot when our family feels like this). However, we stuck to the challenge and made it through the week, so I'm feeling very proud of us! This week, we spent $49.64 on groceries, which included all the food we prepared and packed to eat on our two-day trip to the coast. This means we've spent $104.73 of our $200 budget for the month. Today marks the halfway point of the challenge, so I think we're doing really great! Last week's tasks were to work on menu planning, figure out a solution for Jaymz's lunches, and navigate going on a trip without spending too much of the food budget. Travel: I had planned to spend our food budget on eating out during the trip, but decided at the last minute to make a grocery run and prepare all our food at home to take with us. I'm glad I did that, because we ate really well and it was actually quite fun to picnic on the road like that. Lunches: Our short-term solution is that Jaymz will make himself a stack of sandwiches for the week on Sundays (without condiments to make the bread soggy). He'll grab a sandwich, a fruit and a snack item each morning, and that'll have to do. Our longer-term goal is for him to prepare himself a hot meal on Sundays that he will divide into five portions to take to work. We're just not quite there yet, organizationally. Menu Planning: I think I did well on this one. The thing that had been holding me back from menu planning in the past has been difficulty in sticking to a set meal schedule. I opted to go for what I'm calling the "working menu," which is a list of the meals we'll have for the week, in no particular order. I made sure we had the ingredients for all the meals at the beginning of the week, and then each day I chose from the list based on how much time & energy we had for food preparation. I've already made working menus for this week and next, based on the foods that need to be eaten first. I think this will continue to work well for us: it's planned, yet flexible. I also wanted to mention that we've been keeping a running log of the things that are in our deep freezer (the type of food and number of units/bags/containers) which gets updated whenever something goes in or comes out. I thought this would be difficult for me to maintain, but so far it's been simple and very helpful to know exactly what's in there. Now if I can only get Jaymz to remember to update the list! I have to admit that preparing all the food for our trip ahead of time was a lot of work, but it was also really gratifying to know that we're able to take a family trip without eating out so much. I packed more food than we ended up eating, but I was just glad we didn't run out and have to break the budget. We made a point to stay at a hotel that had a mini-fridge and a microwave so that we could safely store and reheat food. I think the trickiest part about packing the trip food ahead of time was that everything for me had to be gluten-free, and I've already gone through most of my store-bought gluten-free snack foods. We ended up making some GF biscuits from various flours from the pantry, which I ate with eggs for breakfast and with cheese and meat for lunches. I also made a GF pasta salad (heavy on protein) which was my favorite travel food of all of them. We had leftover dinner foods at the hotel the first night, and I also made some of Kristin's allergy-friendly hazelnut shortbread (completely from things I already had!) for a car treat. The food we took with us felt a lot better to my body than most of the things I usually eat when we're on the road, so I was very grateful for that. Also, this week I've been thinking: as much as I think that hoarding food isn't the best use of our resources, there's something to be said for stocking up on food ahead of time. Stocking up prevents running out of a critical food item in a pinch, which can be anything from mildly inconvenient to meltdown-inducing. I know this is just another balancing act I'm getting the hang of, but I'm definitely seeing renewed value in buying in food items in bulk when they're on sale. I'm planning to spend most of this week's food money on an order from our bulk foods delivery. I have been saving a lot of money this way in the past, and it's getting to where we could really use a few of the basics (GF flour, some produce, cheese, etc.). The remainder of our weekly budget will go to buying sandwich fixings for Jaymz's lunches. Because we'll be using our allotted food money on the bulk foods delivery, Daniel and I in particular will have to eat more foods from the freezer and pantry for breakfasts and lunches this week. This will require more prep-time of me during the day, which I'm feeling apprehensive about given the current state of Daniel's nervous system. Similarly, I'd like to consume mostly freezer and pantry foods for dinner this week as well. My working menu this week centers around those items, I'm hoping to go through most of the things in boxes (like pasta) and the full meals in the freezer (soups and such) by the end of this challenge, if we can. That's all for now. I'm excited for the second half! I was inspired to challenge myself to reevaluate my food hoarding and downsize our family's stock of stored food (in part) by Momma Jorje's Monday Minimalist series. 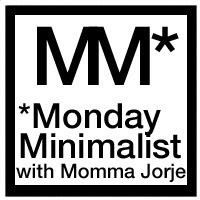 I'll be participating in Monday Minimalist for the Mondays in November, giving you updates on the progress of our family's minimalist food challenge. Head over to Momma Jorje and grab her new MM button! I'm proud of you, too! I'm trying to minimalize some of our groceries, but I think you'd laugh if you saw our "collection." We just don't have much SPACE in our new, shared residence for groceries. We literally have 2 shelves. Its kinda crazy. But I have some snacks on a different shelf that I don't want to use for food at all, so I'm trying to use some stuff / minimalize some groceries to make room for the snacks with the rest of the food. You're doing an amazing job! You really made me re-think my overwhelmed feelings about planning ahead and preparing meals and being gluten free.... It's not "if she can do it" kind of feeling, just a really inspired feeling. I hope the second half goes really smoothly. I can't wait to read how much of this you'll continue.